No matter the size of your living space, you can follow the lead of this DIY to turn a garage fixture into a lofted bed. Downsizing from a sprawling abode to a tiny home requires sacrifices of space and comfort—especially when it comes to the bedroom. Instead of sleeping on a comfortable queen-sized mattress, tiny home owners usually spend their nights on a convertible bed or lofted bed accessed by stairs. DIY blogger Ana White, who was designing a small house from scratch, disliked the space-consuming construction of traditional lofted beds. Instead, she brought a garage door lift system indoors to build a dreamy sleeping arrangement that makes room for not one but two beds. 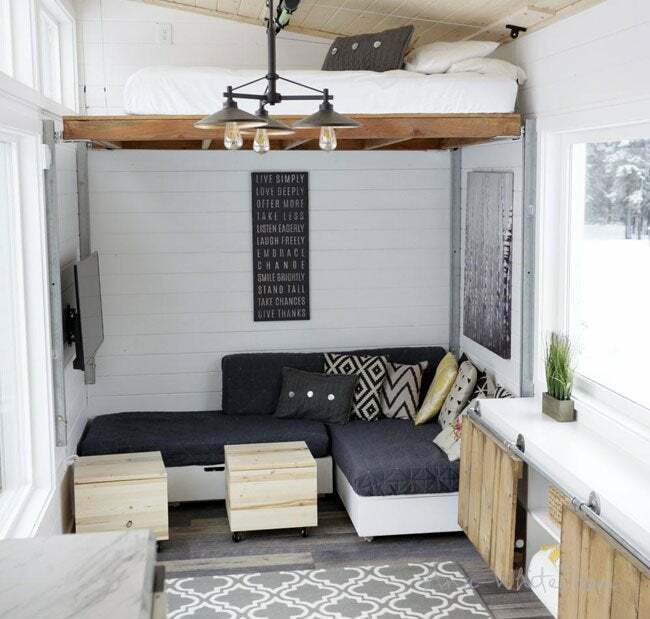 Following Ana’s plans for a DIY loft bed, you can recreate the rustic nighttime sanctuary in your own tiny home or other space-challenged interior. 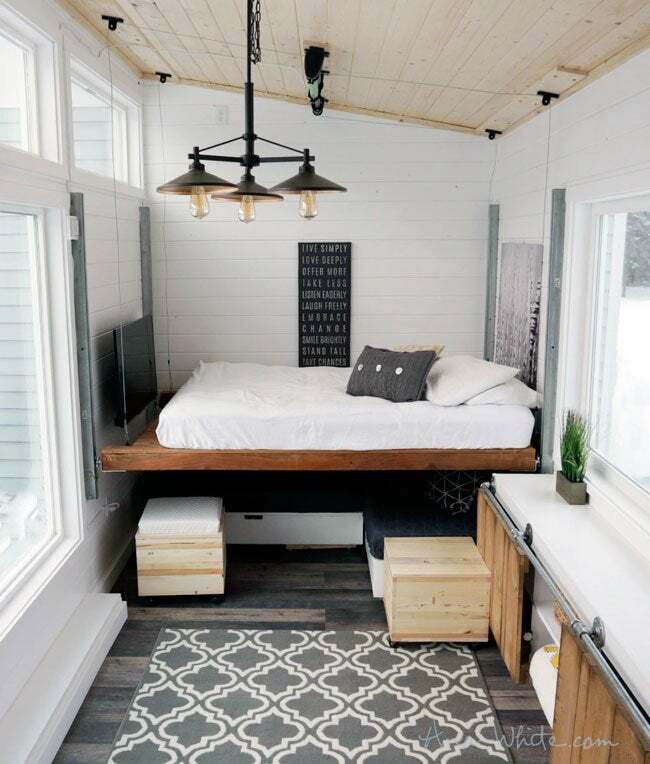 With her client’s 13-foot-tall tiny house framed on a 24-by-8.5-foot trailer, Ana needed to make smart use of the limited space to create a functional yet comfortable alternative to a full-sized bedroom without cramping the living space. She devised a genius solution: An “elevator” that raises and lowers a lofted bed via a garage door lift system. After installing the lift on the ceiling and sliding door hardware to two walls at the back of the tiny home, Ana strung up a wooden bed frame on pulleys to create a height-adjustable sleeping space. During the day, it remains in the highest position nearly 7 feet off the ground, neither eating up precious real estate on the floor nor creating a significantly lower ceiling in the cove with the sectional sofa. Yet, with the push of a button, the DIY loft bed effortlessly moves from a lifted position at the top of rail to a floor-level position at the bottom of the rail. Homeowners can also adjust the loft bed to a half-height position, which leaves ample space in the cavity below. Ana furnished this space with a sectional that swivels to convert into a second bed in minutes, providing guests with a bunk-bed style sleeping solution. While the garage door lift is rated to hold up to 250 pounds—easily enough support to move the platform bed up and down—pins bolted into the wall lock the lofted bed securely in place at whichever height you choose rather than leaving it suspended, so that you can rest easy without the bed wobbling. The adjustable height of this ingenious DIY loft bed makes Ana’s custom-designed tiny home feel open and spacious. Both homeowners and visitors have their own private, secluded space for relaxation without the threat of claustrophobia. Plus, if you position the lofted bed facing large windows like Ana did, it serves as the ideal vantage point to admire your outdoor surroundings. We’re just about ready to pay a visit to this Alaskan retreat!